[I] am a noodle bowl addict. One of my greatest achievements is making a bowl of noodles so fiery that it made my husband cry. I have at least five kinds of noodle in my cupboard at all times, currently three types of chilli sauce, one pot of kimchee and two kinds of dried seaweed. But do you know what? If you haven’t got any of that, it doesn’t matter at all. 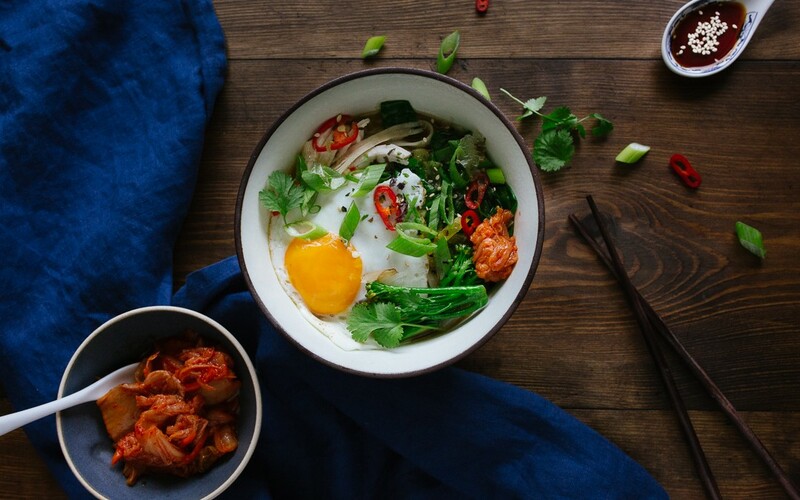 A noodle bowl is the perfect quick fix for using up almost any kind of leftover. Firstly the noodles can be whatever you prefer. 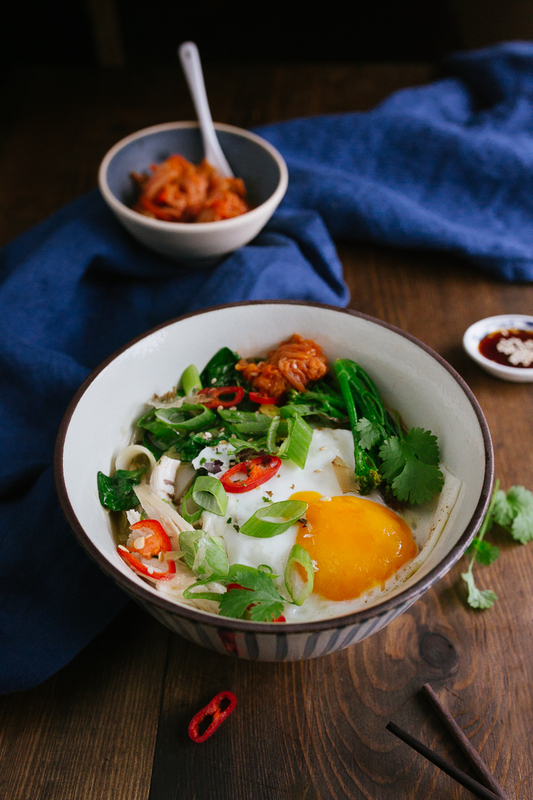 At the moment, because I’m really trying to clean up my act in terms of processed wheat, I’ve been going for silky Laksa-style rice noodles, which resemble a translucent tagliatelle, but believe me, I’ve made many a tasty noodle bowl with a humble packet of super noodles. So, vermicelli, udon, soba or egg noodles – they all work a treat. Next up, you need veg that give punch and crunch – finely sliced red onion or lots of spring onions with some peppers or finely sliced carrots or beansprouts, if you have them (no one has these lying around!). And something green and nutritious – spinach, broccoli, kale, for example. Don’t forget your aromatics – chill peppers, garlic, ginger and coriander. If you really want to push the boat out, add some protein. Try finely sliced leftover roast beef, shredded leftover turkey or how about a lightly fried egg to lift things? Now, for the basic broth. You will need a couple of storecupboard basics. Sesame oil, light soya sauce and fish sauce are must-haves. Everything else you can wing. I make my broth with some powdered miso soup base that I ordered from The Asian Cookshop, but I’ve also had great results with plain old chicken or vegetable boullion that you can buy in any supermarket. If I have leftover chicken stock hanging about, I throw a bit of that in too. I like to also add a splash of sweet chilli sauce and a squeeze of lime, to give the classic balance of Asian flavours – sweet, salty, hot and savoury (umami). My favourite part of a noodle bowl is the garnishing. Lots of fresh coriander, a splash of fiery chilli sauce, a scattering of seaweed flakes and a dollop of fermented kimchee. Don’t forget the extra sliced chillies! Before you begin, make sure you have all of the vegetable you are planning to use, finely chopped and ready to go. Most noodles cook quickly and things move fast once you get going. 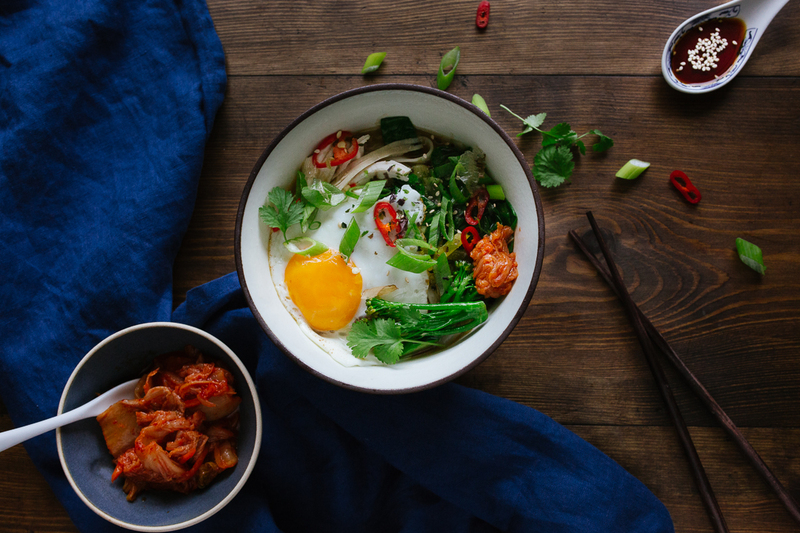 Add all of the broth ingredients to a saucepan, bring to the boil and add your noodles. The broth should be enough to serve two people and cook your noodles through. Taste the broth and adjust the balance of flavours if you need to. 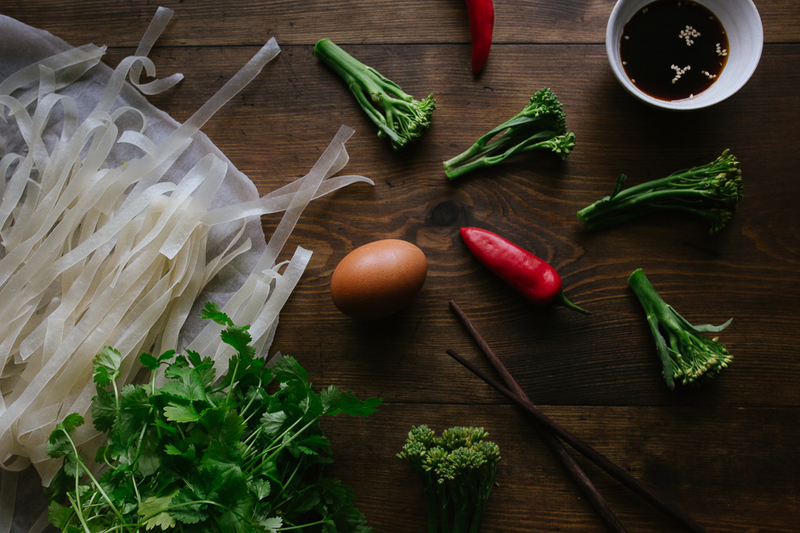 With 3-4 min to go before your noodles are cooked, add any veg that needs a little cooking like broccoli or carrots. Leave soft greens like spinach to the very end. If you are adding a fried egg, fry it now and take it off the heat when just set. To serve, pour your noodles and vegetables into your serving bowls. Arrange your meat and submerge it in the broth to warm it through. Carefully add your egg. Add fresh coriander, extra chopped spring onions and chillies and scatter over your optional garnish ingredients. Finish with kimchee and an extra dash of chilli sauce if you fancy it. I shall be trying this tonight. We have been ‘noodling’ for ever and love the quick, easy and healthy ways in which we can eat our leftovers. The remainder of our Sunday roast is going in ours tonight as you have just inspired us again…. It’s such a great way to use up leftovers. I love it. My kids are obsessed with mini chicken ramen ( we adapted a Wagamama’s recipe) and as you say – perfect for using the leftovers up from Sunday lunch – we always chuck the leftover greens in too.